The expansive spectrum of colors in our surroundings can be muted as we dash through the day, but this oft-overlooked environmental element is more persuasive than meets the eye. The color palette adds an important dimension to life that is invigorating and inspiring, even in subtle respects. The gamut of scientific and philosophical color theorists and artists who use color as their primary creative element is limitless. Just to name a few early thinkers: Aristotle wrote on the nature of light and color, Newton proposed that light was the source of the color sensation and Goethe published his comprehensive Theory of Colors in which he ascribed psychological effects to color. In the 19th century, Impressionists were inspired by the scientific observations of Chevreul who noted “simultaneous contrast” in juxtaposed colors. Today, there are many who bring new insights into color dynamics that continue to be revelatory. Color is a major influence on the act of creating and on the experience of seeing and, thereby, feeling. This is reflected in the chakras of the Hindu religion, the canvases of 20th and 21st century painters and the interiors of today’s designers. 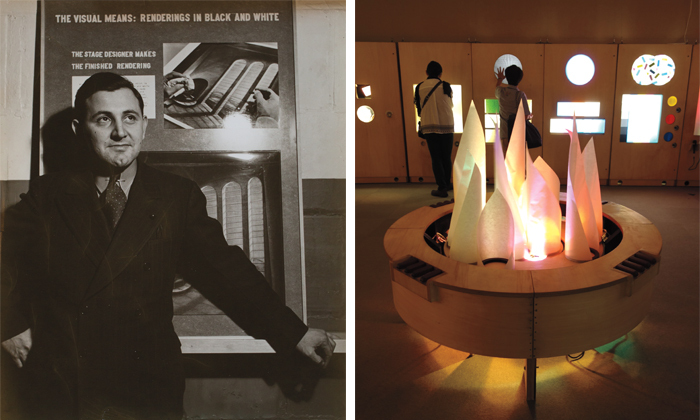 Of the many approaches by educators, artists and designers who explore the power of color in the recent past and in the contemporary art scene, these are a few of particular interest. 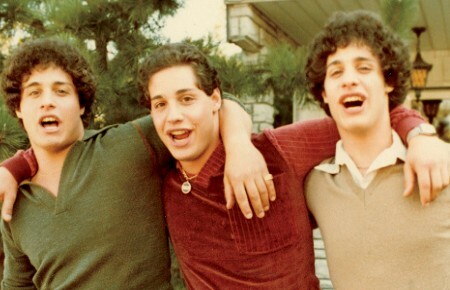 He took these classes to East Hampton in 1955, and with that move D’Amico had an even larger vision. He sought a place “more dramatic and reflecting the character of the environment—sky, sea and salt air, either a boat or resembling one,” and the Art Barge was born. A 500-ton retired World War I Navy barge from Jersey City was towed up the East River into the Long Island Sound and to the shore of Napeague Harbor, where his art education legacy continues. Still a MoMA property, the D’Amico Studio and Archive displays these experimental color, line and form work stations and the adjacent Art Barge offers classes in watercolor, drawing, printmaking, sculpture, photography and ceramics, welcoming artists of all ages and levels of expertise. As a student of Joseph Albers in the early 1970s, Beth Ames Swartz learned about color theory and the impact of one color in juxtaposition to another. She took that understanding to a more comprehensive understanding by focusing on the ancient Indian Hindu religion in which the seven chakras (spiritual energy-centers) in the body and the color related to each merge, becoming a totally engulfing aesthetic experience. The system of chakras has its origin in the practice of yoga that dates from 2,000 B.C. The colors relate to seven energy centers in the body. Red, the base of the spine, relates to our instincts of survival; orange, the stomach area, relates to our childhood; yellow to our empowerment area in the solar plexus; green to our heart and the ability to give and receive; blue to our throat area and the seat of creativity and communication; indigo, the third eye, between the eyes, to inner wisdom and finally, violet to the head and our relation to a higher power. Swartz’s A Moving Point of Balance, a series of 7×7 foot large-scale paintings, was first exhibited at The Nickle Arts Museum in Calgary, Canada in 1985 and later travelled to 11 museums across the country. This series gives viewers an opportunity to experience one paint-encrusted painting at a time, bathed in a colored light dedicated to each chakra and accompanied by soft music. According to audience surveys, viewers were “spiritually” and “emotionally” moved. A new film about the artist, Reminders of Invisible Light, is currently available on PBS networks. American Abstract Expressionists painters (just being recognized in the 1940s and 50s) were inspired by the French Modernists Picasso and Matisse and the Surrealists Miro, Ernst, et al. But it was Hans Hofmann in New York in the late 1930s who taught not only the Cubist theories of abstraction but also the “push and pull” of color to one of his most talented students, Lee Krasner. 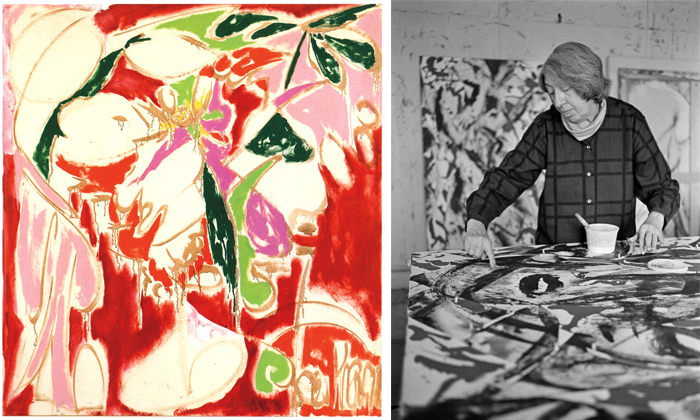 As first-generation Abstract Expressionists, Lee and her husband, Jackson Pollock, moved to East Hampton in 1945. Soon thereafter, she made two colorful mosaic tables for their new home, using wagon wheel rims she found on the property. Multicolored shards of broken glass, keys, coins and costume jewelry are among the materials she collaged onto the tabletops and grouted with cement. The results are functional and, more importantly, add chromatic vibrancy to the domestic décor. The canvases Krasner painted immediately after her husband’s death in 1956 are the most fascinating in terms of color. Her so-called Earth Green series is notable for its high-key tonality, including brilliant pinks and electric greens. Here she took the “push and pull” of Hofmann’s theories to a new level—foreground and background become one in a storm of sensual activity. 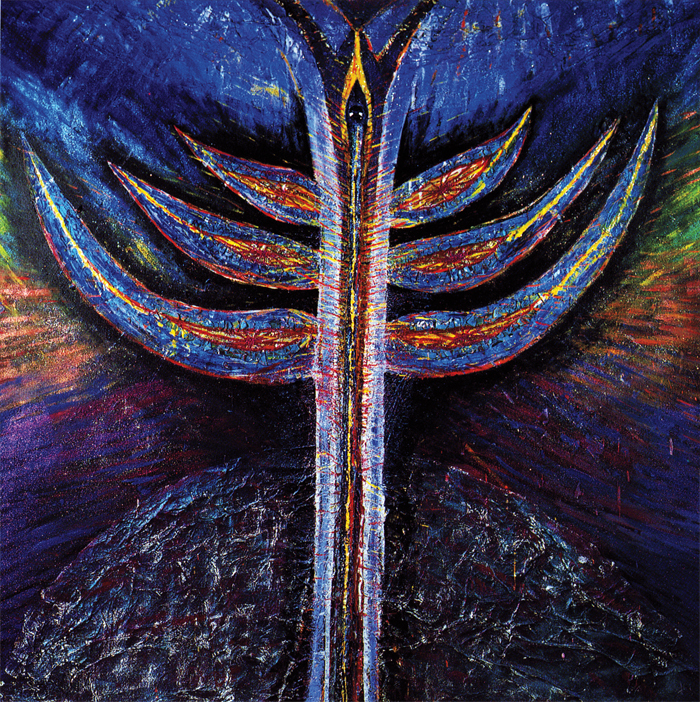 The tensions between warm and cool color, between line and void and between inside and outside were used to activate the surface creating what Hofmann wanted: “equilibrium.” Instead of the static compositional style of her teacher, she developed a swirling, dynamic style, a heroic resolution of size, movement and creativity. Paradoxically, while creating these brightly-hued canvases in 1957-58 she was in mourning. She later recalled that “the tears were pouring down my face” as she was painting some of her most colorful, expressive imagery. 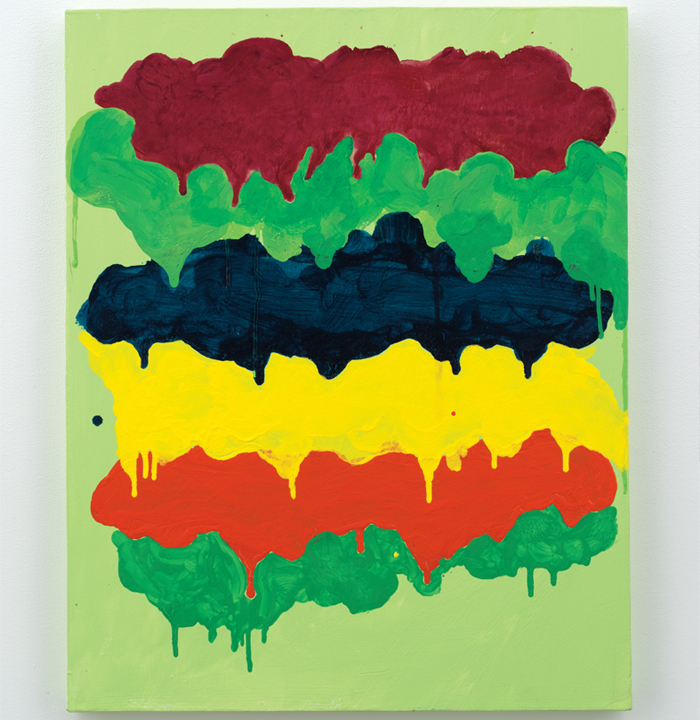 The high-pitched, unorthodox pop colors in works by California-trained, New York resident Mary Heilmann forces the power of the painted/sculpted image to a new reality. Like Krasner, who took the functional aspects of furniture to a more creative level, Heilmann can move from furniture construction to painting while maintaining the integrity of the aesthetic canon. Her box-like chairs, wobbly bowls and often shaped, unorthodox canvases confirm her reputation as “beatnik-surfer-hippie-chic,” using a varied palette of so-called “gauche” colors inspired by cartoons and hip beach culture. Juxtaposing seemingly random colors, her loosely executed brushstrokes often slap across the canvas. 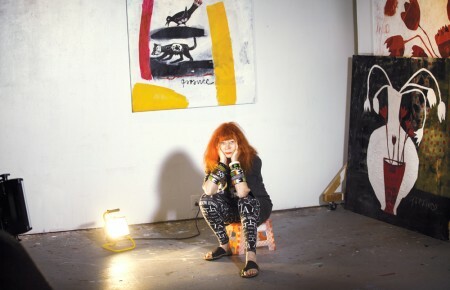 Heilmann often employs the abstract “action” technique in unorthodox ways, then she may switch to canvases that are hard-edged or filled with polka dots. Still, there is no denying the authorship. These seemingly random works all carry Heilmann’s own powerful, unmistakable artist signature. In her own words: “Often when I am in the process of working, I sit and concentrate on the imagery and color in the pieces. It is almost like meditation. What goes along with that is thinking about the stories that are behind the colors and forms in the work. It is like a dream. When looking out at my Bridgehampton farm it relates to the color of the current season.” Certainly, in summer the vivid yellow field of sunflowers adjacent to her home is an inspiration. Both Krasner and Heilmann (while traditionally trained) chose an anti-academic approach to their work. Trusting their unconscious, their hands-on “crafts” approach gives rise to a powerful, emotional impact. 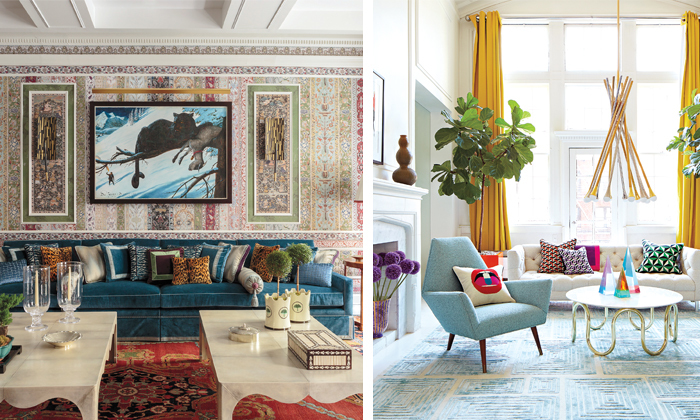 Richard Mishaan and Jonathan Adler are at the top of their game. Both designers enjoy homes on the East End and high-profile careers managed from headquarters in New York City. They both also share an unabashed love of color. Adler has loved making pottery since he was a 12-year-old in summer camp. His academic training at Brown University was overshadowed by his time spent at nearby Rhode Island School of Design making pots that were inspired by early hip-hop bling, contemporary art and fashion. His genius was recognized early when at age 27 he launched his first ceramics collection at Barney’s New York in 1993. Since then he has opened 30 stores and is the author of several books on interior design and origami. By taking the opportunity to experience color, we can share the life affirming quality of the arts. That experience will be elevated and enhanced by those who have made it their passion. No other experience is so easily accessible and so readily embraceable. Color can dictate our feelings—of shock, of joy, of taste, of our sense of well-being or emotional excitement. These artists and designers have made color a priority in their work and lives. Now, it’s up to us to see it for what it can be.